AC/DC (1973-present) is a Hard Rock band from Sidney, Australia. C/DC were Australia's contribution to metal and their answer to the fast approaching punk movement. Their name was taken from the printing on the back of on a sewing machine but could have easily have come from their electric stage performances. Angus Young (guitar) and brother Malcolm Young (guitar) founded the band after the demise of Malcolm's previous outfit Velvet Underground in 1973 (not to be confused with the New York-based "Velvet Underground"). They enlisted Dave Evans (vocals), Larry Van Knedt (bass) and Colin Burgess (drums). Their first performance was 31 December 1973 in a Sydney bar. While living in Melbourne, Australia (the Young brothers were from Scotland originally) they met Mark Evans (bass), Phil Rudd (drums) and Ronald Belford "Bon" Scott (vocals). These new members would replace the incumbents, most notably was Scott who replaced Evans in September of 1974 when Evans refused to take his place on stage; previously Scott was the band driver. Soon after, Scott was initiated into AC/DC in time for the first two albums, High Voltage (1974), and T.N.T (1975); albums that were published by a third Young brother, George, who was co-owner of 'Albert Records'. These, and their first single, Can I Sit Next To You, were only available in Australia. The recording of High Voltage took only ten days and was based on instrumental songs written by the Young brothers, with lyrics added by Scott. January of 1976 would see them re-locate to London, UK when Phil Carson of 'Atlantic Records' signed them where they would make it big with a fresh start. Although the track selection was weighted toward the more recent T.N.T. album, the first two albums were compiled into a single one named High Voltage for the UK audience in 1976; it would eventually earn a US platinum award. By their proper world debut, Dirty Deeds Done Dirt Cheap (1976), featuring all new material, they were achieving cult status. The album's track listing, however, varied in each market it was released in; the "international" version featured the T.N.T. track Rocker, which had previously not been released internationally, while the Australian version included Jailbreak, and the US would not see the album at all until 1981. Highway To Hell (1979) became the first AC/DC recording to break into the US top 100, eventually reaching 17, and pushed AC/DC to the levels of fame seen by other top ranked of hard rock acts. Highway to Hell moved away from the past flippant and comical themes toward more central and traditional rock ones, emphasizing backing vocals, harder riffs and solidifying the act's signature simplistic formulated sound: loud, grooving back beats supported by simple riffs and lyrics. A coroner's report stated a "Misadventure" upon the examination of Bon Scott on February 20, 1980 and declared him dead of "acute alcohol poisoning". He choked on his own vomit after a night of binge drinking at the 'Music Machine' bar. A friend drove him back to his place to let him sleep it off but could not move him from the car. Still unable to wake him the next morning, he was driven to the hospital where he was declared dead on arrival. In came Brian Johnson (the band's tour driver) to take up the vocals after a competition of auditions. In 1980 the Back In Black album was released to celebrate their return. It rocketed up the UK and US charts, obtaining a 17 and 8 respectively from tracks like Hell's Bells and You Shook Me All Night Long. In 1981 it was followed by For Those About To Rock, which saw them rise to #1 in the UK and Australia, and got them a spot at the coveted Castle Donnington rock festival. Another line-up change saw Rudd replaced by Simon Wright. The self-produced 1983 Flick of the Switch album was was less successful than their previous albums, and was considered underdeveloped and unmemorable by critics, other than perhaps the title-track; the album was an attempt to re-capture their 'rawness' of the past that came across, as one critic put it, "the same album nine times over". Now AC/DC took a more market-wise approach with relaxed tour schedules and carefully spaced albums. But of their later material Fly On The Wall (1985), Who Made Who (1986 a soundtrack album whose title track was a successful spin-off single), Blow Up Your Video (1988), and the single Thunderstruck spun off from their Razor's Edge (1990) album, although less noted, were probably the biggest hits; the former giving them a 4 US and 2 UK charting. Blow Up Your Video saw another line change with session musician Chris Slade (ex-Manfrid Mann's Earthband) replacing Simon Wright, who left to join Dio. The next album, The Razors Edge (1990), recorded in Vancouver, British Columbia, Canada, was a major comeback for the band peaking at 23 on the Billboard Hot 100 and eventually going multi-platinum. It wasn't long, however, before Phil Rudd then rejoined to assume the drum stool from the departing Slade. During the 1990s they would continue with their risqué brand of hard rock and spectacular live shows utilizing cannons, pyrotechnics, props and Angus Young's trademark schoolboy uniform (this outfit was selected in favor of the other options of a Gorilla, Superman or Zorro). By doing so, AC/DC made themselves a standard in any heavy metaller's collection, even if by Ballbreaker (1995) and Stiff Upper Lip (2000) their sound seemed dated and tired. Containing four albums in all: a remastered version of Back in Black, Volts (a disc with alternate takes, outtakes, and stray live cuts) and two live albums: Live from the Atlantic Studios and Let There Be Rock: The Movie, 1997s box set Bonfire would arrive. The Live from the Atlantic Studios component was originally recorded on 7 December 1977 at the 'Atlantic Studios' in New York, while Let There Be Rock: The Movie was a double album recorded in 1979 at the 'Pavillon de Paris' and was the soundtrack of the movie: AC/DC: Let There Be Rock; the US version of the set included a color booklet, a two-sided poster, a sticker, a temporary tattoo, a key-chain bottle opener and guitar pick. In 2002, AC/DC signed a long-term, multi-album deal with 'Sony Music', the result of the marriage was a set of remastered albums as part of their "AC/DC Remasters" series. Each release contained an expanded booklet featuring rare photographs, memorabilia, and notes. In 2003, the entire back-catalogue (except Ballbreaker and Stiff Upper Lip) was remastered and re-released. Ballbreaker was eventually re-released in October 2005, while Stiff Upper Lip was later re-released in April 2007. Also in 2003, the band was inducted into the Rock and Roll Hall of Fame. On 30 July 2003, the band performed with the Rolling Stones and Rush (among others) at Molson Canadian Rocks for Toronto. The concert, held before an audience of 500,000, was intended to help the city overcome the negative publicity stemming from the effects of a 2003 SARS epidemic. The concert would come to hold the record for the largest paid music event in Canadian history and among the short list of largest in North American history. The show, performed at the decommissioned Royal Canadian Air Force base Downsview, became Canada's fifth largest city! The band came second in a list of Australia's highest-earning entertainers for 2005, and sixth for 2006, despite having neither toured since 2003 nor released an album since 2000. AC/DC made their video game debut with "Let There Be Rock" on Rock Band 2, included as a playable track. The set list from their Live at Donington live album was released as playable songs for the Rock Band series by means of a Wal-Mart exclusive retail disc titled AC/DC Live: Rock Band Track Pack. Black Ice (2008) finally saw the band back with a studio album after 8 years. The next year it was followed up with a collection of studio and live rarities, Backtracks as a 3-CD/2-DVD/1-LP box-set, as well as rescheduling six shows when Brian Johnson underwent an operation for ulcers. 2010 saw them in the studio again for Iron Man 2, the soundtrack for the eponymous film. After multiple delays due to health issues, on 19 November 2012, AC/DC released Live at River Plate, an live album featuring three concerts at River Plate Stadium in Argentina; their first live album in 20 years. The future of AC/DC came into question on 16 April 2014, when in response to earlier reports that the band may be retiring due to Malcolm Young being seriously ill and unable to perform, Brian Johnson commented that AC/DC are not retiring and would go to Vancouver, Canada for studio sessions. AC/DC subsequently announced in an official statement on their Facebook page that Malcolm Young would be taking a break from the band due to his ill health. It ended: "The band will continue to make music." On 23 September 2014, Alberts Management confirmed that Malcolm Young had left the band. Their new album, Rock or Bust, was released on 28 November 2014 as the first AC/DC album without Malcolm Young. The band also announced plans for a world tour to promote the new album with Malcolm and Angus' nephew Stevie Young as Malcolm's replacement. Following a police raid on his home, on 6 November 2014, Rudd was charged with attempting to procure a murder, threatening to kill, possession of methamphetamine and cannabis. The charge of attempting to procure a murder was withdrawn the following day, but the other charges remained. 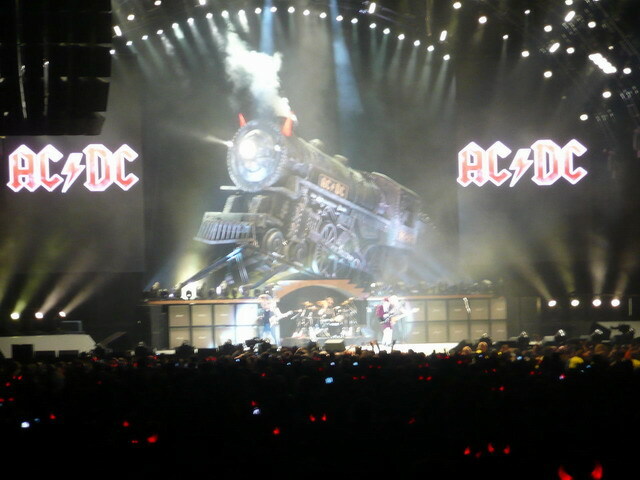 In an interview on 13 November, Angus Young stated that the band had experienced problems with Rudd earlier in the year when recording Rock or Bust, and that his situation had taken the band by surprise, Rudd had also missed video and photo shoots. On 19 April 2016, Johnson made an announcement about his hearing loss he had been suffering for over a year and announced he was now unable to tour; Guns N' Roses frontman Axl Rose was soon after announced as the band's lead vocalist for the remainder of their 2016 tour dates. Three months later, (8 July 2016) Williams decided he was also leaving the band. After his final show of the Rock or Bust Tour, it was announced that Axl Rose joined full-time. He and Angus then announced they would continue AC/DC under a new line-up. Malcolm Young would die on November 18, 2017. He had been suffering from dementia for the past several years. Footnote: Back In Black has been said to be now the third best selling album in history.